The Independent lists Spies Of Warsaw in its list of Television Programmes To Look Forward To In 2013. Broadchurch is one of Radio Times 13 for 2013 - The Best New TV shows For A New Year. Starting at 8am (Eastern) BBC America in the US will broadcast 24 hours of David Tennant / Doctor Who over a 26 hour period into New Year's Day. The Pirates! In An Adventure With Scientists has been voted the 6th Best Movie of 2012 by the critics of the Radio Times. The David Tennant Daily News Digest for Sunday 30th December. Observant visitors to DavidTennantOnTwitter.com will have noticed that the main page of the website has changed slightly so that there is now a Headlines section, plus there are a few other cosmetic changes! The David Tennant Daily News Digest for Saturday 29th December. Spies Of Warsaw is included in Digital Spy's list of 15 Exciting New TV Shows For 2013. Film Music reporter has an article about Olafur Arnalds writing the score for Broadchurch. Jonathan Bailey says some lovely things about working with David Tennant in Broadchurch in an interview in The Sun. A new interview with David Tennant on the set of Spies Of Warsaw is printed in the TV Times, plus the magazine gives the drama 5 stars in its preview. The David Tennant Daily News Digest for Friday 28th December. The Polish television station TVP has posted a new video about Spies Of Warsaw with a nice quote about David Tennant. The Guardian has an article looking at television programmes in 2013. One section is titled "Tennant and Colman will reign supreme" and includes the description "Post-Doctor Who and Peep Show, the brilliant David Tennant and the even better Olivia Colman will be everywhere next year. The rarely resting actors star together in ITV's Broadchurch, an ensemble piece about the media descending on a small seaside town after a boy is murdered. Tennant goes solo in BBC4 wartime yarn Spies Of Warsaw as well as The Politician's Husband." BBC America in the US will broadcast 24 hours of David Tennant / Doctor Who from 8am on 31st December and into New Year's Day. �lafur Arnalds posted that today they started piano recordings for the first 4 episodes of Broadchurch (in Iceland). 19 new photos from Spies Of Warsaw have been posted onto a Polish website including several photos of David Tennant. There is a photo of David Tennant from Spies Of Warsaw in the Radio Times. FlickeringMyth.com reports that Nativity 2 Danger In The Manger! this week has dropped one place at the UK box office to #4 and that it took �1,188,380 in its 5th week since its release. The television critics of the Radio Times have voted Twenty Twelve as their third favourite television show of 2012. The Coventry Telegraph has a sweet story about the child actors going on a school trip to the cinema to watch themselves acting with David Tennant in Nativity 2 Danger In The Manger! The Daily Record lists Nativity 2 Danger In The Manger! as one of its Top Five Worst Movies of 2012. BoxOfficeMojo have posted that The Pirates! In An Adventure With Scientists is the 18th highest grossing movie in the UK and Ireland during 2012 and Nativity 2 Danger In The Manger! is the 47th highest despite only being released five weeks ago. The David Tennant Daily News Digest for Thursday 27th December. At midnight the BBC released some new promo photos from Spies Of Warsaw which were posted onto BlogtorWho. The David Tennant Daily News Digest for Wednesday 26th December. In September we announced that we would post a David Tennant Daily Photo each day for three months. Those 3 months ended yesterday but the item has provided to be very popular so we have decided to continue it! However we would like some suggestions of what YOUR favourite photo (or two!) of David Tennant is which we may use! Please send any suggestions to our email address which is available in the Website section of DavidTennantOnTwitter.com. The David Tennant Daily News Digest for Tuesday 25th December. TescoDirect have Tree Fu Tom toys available to pre-order, including David Tennant's character Twiggs. On BBC One at 5pm today is the UK terrestrial television premiere of the movie How To Train Your Dragon. David Tennant provided the voice for a character called Spitelout in the movie but unfortunately he only has about three lines. Link to pre-order the Doctor Who stamps plus the chance to win some Doctor Who merchandise. The stamps will be available in March. There's loads of press this morning about the Doctor Who stamp collection. The Daily Mail has an article which shows examples of all the stamps. 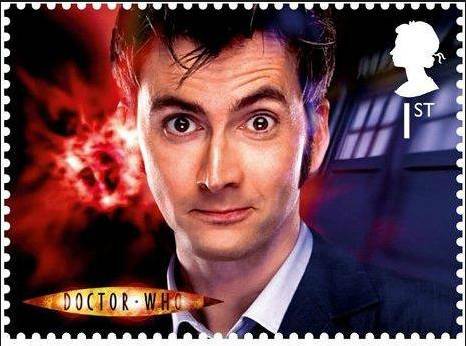 The Royal Mail have announced that David Tennant will feature on one of Doctor Who's 50th anniversary first class stamps. MP3s of the new segments from all three hours of David Tennant on Absolute Radio on Christmas Day. The David Tennant Daily News Digest for Monday 24th December. At 10am David Tennant will be featured in the (pre-recorded) programme Christmas Morning With Christian on Absolute Radio. It was 7 years ago today that David Tennant appeared in his first full episode of Doctor Who - The Christmas Invasion! CrimeTimePreview have posted the first preview of Spies Of Warsaw and it ends with the phrase "Spies Of Warsaw is a reminder of how charismatic a performer Tennant is." A video of the clip from Spies Of Warsaw which will play worldwide has been added to Tumblr. In the UK Spies Of Warsaw will be repeated the Saturday following the original broadcast (i.e. 12th and 19th January) on BBC HD at 11pm. The David Tennant Daily News Digest for Sunday 23rd December. Absolute Radio are listing a programme with the strap-line "David Tennant joins Christian O'Connell and Richie on Christmas morning for the funniest way to wake up and open your presents" for tomorrow between 10am and 1pm. It will not be a live programme and most likely is just clips from David Tennant's appearance on Absolute Radio last Friday. A photo of David Tennant with a Doctor Who numberplate has been posted onto Tumblr. This photo was taken at the Midnight Fan Convention recently. Stuff.co.nz reports that UKTV in New Zealand will focus on one Doctor a month in 2013 with one Doctor Who story each Sunday afternoon, with each month devoted to a different incarnation of The Doctor. We now have over 120,000 followers on Twitter! The David Tennant Daily News Digest for Saturday 22nd December. The Polish website Wirtualnemedia has some new photos of Spies Of Warsaw including one of David Tennant here. David Tennant Quiz #127 (hosted by @DTQuiz) is at 6pm tonight about all of David Tennant's episodes of Doctor Who. David Tennant will be on The Jonathan Ross Show on ITV on Saturday 5th January at 9.45pm. The show records on Friday 4th and this is the link to apply for tickets to watch the recording. The Express has an article about David Tennant in the Absolute Radio Nativity play yesterday which starts with the phrase "Known for his powerful Hamlet and his very popular Doctor Who..."
The Guardian has an article titled "Nativity 2 blessed with mass audience goodwill despite critical mauling" and the sub-title "Film about group of schoolchildren in a Christmas carol contest attracts huge crowds at box office despite savage reviews." The article also says that Nativity 2 Danger In The Manger! is set to become the biggest British independent film of 2012. A video where David Tennant tells DigitalSpy his favourite movie of 2012. David's segment is at the start of the video. The David Tennant Daily News Digest for Friday 21st December. In a bizarre article the Belfast Telegraph CLAIMS David Tennant is "considering spicing up his sprouts with a dash of chilli." ThisIsBristol has an interview with Joe Sims about working on Broadchurch. The Guardian lists an app from Digital Theatre where you can stream Much Ado About Nothing onto your phone in its list of 40 Best iPhone and iPad Apps. Rex Features have some photos of David Tennant in the Absolute Radio nativity play this morning. Absolute Radio have added the Nativity play in 3 parts to YouTube: Part One, Part Two and Part Three. The List have an article about David Tennant on the Absolute Radio Nativity play today which is titled "David Tennant hints at Doctor Who anniversary appearance" although that is not what David said. Absolute Radio have aded a photo album of pictures from the Nativity play today. Radio Today also has an article about David Tennant in the Absolute Radio nativity play today which is titled "David Tennant in a dress? Absolute-ly!" The London Evening Standard has an article titled "Actor David Tennant has a wee plan to keep foxes off his patch." The Daily Record has an article about David Tennant in the Absolute Radio Nativity play today which also mentions Spies Of Warsaw. The Evening Standard has a photo of David Tennant, Christian O'Connell and Ian Wright from the Nativity play today. On Absolute Radio today David said that nobody had telephoned him about the Doctor Who 50th anniversary in 2013. The David Tennant Daily News Digest for Thursday 20th December. MPs of all four hours of David Tennant on Absolute Radio today. Absolute Radio have posted a photo of David Tennant and the cast of Nativity 3 Where's My Donkey?. Absolute Radio have posted a photo of David Tennant dressed as Mary. From 6am today David Tennant will co-host the Absolute Radio Breakfast Show with Christian O'Connell including their Nativity play at 8am. This link has full details about David Tennant on Absolute Radio including the link to listen worldwide. The first BBC trailer for Spies Of Warsaw was broadcast on BBC Four tonight and has been posted onto Tumblr. The Sonnets app is voted one of the Top Ten apps of 2012 by The Independent. The David Tennant Daily News Digest for Wednesday 19th December. The DVD of Nativity 2 Danger in The Manger! will be released on Monday 18th November 2013. It can be pre-ordered on Amazon. A new clip of David Tennant in Spies Of Warsaw was shown on a news programme on Polish Television tonight. The Guardian has reported that Nativity 2 Danger In The Manger! has gone up two places back to #3 at the UK Box Office. This week it took �938,309 from 508 sites and has taken �5,582,224 in total so far. In an interview with Vulture Doctor Who producer Steven Moffat says that he recently had dinner with David Tennant who was exicted to see photos of the new Doctor Who monsters on Steven's phone! The BBC Media Centre has confirmed that, as expected, episode 2 of Spies Of Warsaw will premiere on BBC Four on Wednesday 16th January 2013 between 9pm and 10.30pm. Some videos of David Tennant and Billie Piper from the Midnight Fan Convention have been posted onto YouTube. David Tennant and Billie Piper talking about the parallel universe Rose and Doctor 10.5. David Tennant and Billie Piper talking about the Doctor Who monster the Zygons. David Tennant and Billie Piper talking about possible future collaborations. David Tennant and Billie Piper saying goodbye and David says Allons-y as a fan had requested. The television station Watch will have a David Tennant / Doctor Who afternoon on 1st January 2013. The David Tennant Daily News Digest for Tuesday 18th December. Broadchurch actor Will Mellor tweeted that he believes that the drama will start airing in March. Two of David Tennant's episodes of Doctor Who (Blink and Midnight) will be featured in the Cine Lumiere Doctor Who Night on 19th January in London. The weekly round-up of David Tennant news from the Scottish Actors blog. This week it includes Midnight Fab Convention, The Escape Artist and Spies Of Warsaw. The BBC have added their media pack for Spies Of Warsaw which includes two new photos of David. There is also an interview with David at this link. The Nativity 2 Danger In The Manger! movie soundtrack is now available on CD. The David Tennant Daily News Digest for Monday 17th December. iMediaMonkey reports that Broadchurch will be sponsored on ITV by Viking River Cruises. An audio recordimg of the David Tennant and Billie Piper panel on Sunday at the Midnight Fan Convention has been posted onto MixCloud.com. The ChicagoReader lists The Pirates! In An Adventure With Scientists as one of its Best Animated Films Of 2012. Christian O'Connell is asking for help for writing the Nativity play which David Tennant will star in on Friday on Absolute Radio. Currently Christian is looking for funny titles for the play and has suggested people use the hashtag #twitvity to post them onto Twitter. TV critic for the Daily Mail Robin Wiggs tweeted that he thought Spies Of Warsaw was 'really rather good' and described David Tennant in it as 'broodsome'. The Metro newspaper has a contest today to watch David Tennant perform in Absolute Radio's nativity play on Friday. The David Tennant Daily News Digest for Sunday 16th December. A detailed report about the David Tennant / Billie Piper panel at the Midnight Fan Convention today. A great photo of David Tennant and Billie Piper hugging on stage at the Midnight Fan Convention has been posted on Instagram and another one of them laughing together on stage. David Tennant will record the audiobook How To Steal A Dragon's Sword in January. TV critic Paul Whitelow has described Spies Of Warsaw as "quite good" and he says that David Tennant is shirtless for "a fair bit" of the programme. There is a slight change of title as The Spies Of Warsaw is now called Spies Of Warsaw. On UKTV in Australia clips of Spies Of Warsaw are included in a compilation trailer currently being broadcast. They included some clips which were not included in the BBC America clip. A photo of David Tennant during the solo photo session today. Fans reported that he greeted most people with a cheery "Good morning! How are you?" Three David Tennant programmes will be repeated over the Christmas period - Doctor Who, Earthflight and Twenty Twelve. The first photo of David Tennant at the Midnight fan convention was posted onto Instagram. The description we received about David was that he was wearing a stripped top with jeans and had 'stubble'. The David Tennant Daily News Digest for Saturday 15th December. There are autism-friendly screenings of Nativity 2 Danger In The Manger! in cinemas around the country today. Today David Tennant and Billie Piper attend the Midnight Fan Convention in Birmingham. Amazon are showing a new version of the book The Spies Of Warsaw with a photo of David Tennant on the cover available to pre-order. Tree Fu Tom will start being shown on the Italian television station Freesbie on 24th December at 1.45pm. The David Tennant Daily News Digest for Friday 14th December. 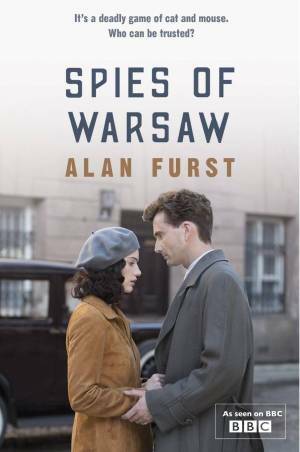 Amazon are now listing the UK release date of the DVD of The Spies Of Warsaw as one week ealier (21st January). However the BBC Shop currently still has it listed as 28th January. The promoters have announced that at the Midnight Fan Convention on Sunday, David Tennant and Billie Piper will both sign one free autograph per person but that fans can also buy another autograph although that is limited to one extra per person. On page 37 tonight of the Evening Standard in the London area there is a half page advert for Nativity Danger in The Manger! including a photo of David Tennant. The Coventry Telegraph has an article about the success of Nativity 2 Danger in The Manger! DenOfGeek have an article looking at the various Doctor Who Christmas Specials. The David Tennant Daily News Digest for Thursday 13th December. Broadchurch producer Richard Stokes has tweeted an update about the post-production work saying that this week they are locking three of the episodes, doing some of the music spots and starting the ADR. The BBC Media Centre have posted the synopsis of the second episode of The Spies Of Warsaw. It is expected to premiere on BBC Four on Wednesday 16th January between 9pm and 10.30pm. The BBC Media Centre have updated their details to reflect that the first episode of The Spies Of Warsaw will premiere on BBC Four on Wednesday 9th January between 9pm and 10.30pm. It is expected that the second episode will be shown at the same time the following week. The David Tennant Daily News Digest for Wednesday 12th December. The Guardian reports that in its third week Nativity 2 Danger In The Manger! is in fifth place at the UK box office. This week it took �966,400 from 476 sites which brings its total to �4,376,499. Unfortunately Twenty Twelve did not win the Best Sitcom Award at the British Comedy Awards tonight. Both TeeFury and ShirtPunch have Tenth Doctor T-shirts available for today only. The latest news from the Doctor Who Magazine is that filming for the Doctor Who 50th anniversary has been moved back to April so David Tennant (in theory) COULD still fit it in after he films The Escape Artist! However please remember that no announcement has been made about whether or not he will be involved or any of their plans. The BBC's original announcement about The Escape Artist (although it does not mention David Tennant). David Tennant will star in The Escape Artist, a new three part drama on BBC One. Den Of Geek have an interview with the writer of The Waters Of Mars, Phil Ford, who believes that that episode was David Tennant's finest hour in Doctor Who. The David Tennant Daily News Digest for Tuesday 11th December. More details about David Tennant's appearance on Absolute Radio in their Nativity play on Friday 21st. Tonight the British Comedy Awards are announced live on Channel Four. Twenty Twelve is nominated in the Best Sitcome category. A couple of people have tweeted today about seeing David Tennant in Los Angeles. Dylan Mariah tweeted a photo of herself with David and another photo of her friend with David. The Daily Record has reported that STV have confirmed they will screen Broadchurch in Scotland in 2013. For today only, AudioGo have made David Tennant's 70 minute long interview about the James Bond Reloaded series available to download for free. Voyage Of The Damned is listed in io9's Best Science Fiction and Fantasy Holiday Specials Ever article. The David Tennant Daily News Digest for Monday 10th December. The weekly round-up of David Tennant news from the Scottish Actors Blog. The BBC Media Centre have posted that the first episode of The Spies Of Warsaw will premiere on BBC Four sometime during the week commencing Saturday 5th January. The exact day and time will be posted nearer transmission. The Brighouse Echo reports that Doctor Who fan Michael Gilroy-Sinclair believes more women have started to watch the programme since David Tennant became The Doctor. Today Christian O'Connell said on the Absolute Radio Breakfast Show that David Tennant will take the role of The Virgin Mary in their Nativity play on 21st December. Also appearing will be Ian Wright and Newton Faulkner. The play will be broadcast from 8am that Friday. To win tickets to watch it in person, Absolute Radio are asking fans to contact them with a fact about the show. The David Tennant Daily News Digest for Sunday 9th December. Today is the final day for the contest to win a �1,000 shopping spree by booking tickets online at ODEON Cinemas for Nativity 2 Danger In The Manger! As it is only a week until lots of visitors to the website will be meeting David Tennant at the Midnight Fan Convention, here are some tips we previously posted about how to get the best out of the experience. The David Tennant Daily News Digest for Saturday 8th December. The David Tennant Daily News Digest for Friday 7th December. The Metro had an article on the rumours that David Tennant (and others) were potential actors for the role of Bilbo Baggins. The David Tennant Daily News Digest for Thursday 6th December. A Daily Mail article lists David Tennant as one of the actors considered for the role of Bilbo Baggins in The Hobbit movie. BroadwayWorld has a detailed article about the PBS broadcast in the US of Shakespeare Uncovered, including David Tennant's episode about Hamlet airing on 8th February. The Hendon and Finchley Times has an interview with Scott Folan who is another child actor who appeared in Nativity 2 Danger In The Manger! The first episode of The Spies of Warsaw will be broadcast on 11th January 2013 at 8.20pm in Poland. (It will be dubbed into Polish.) As we previously posted the drama will be broadcast on 6th and 13th February in the US and the UK broadcast (on the station BBC Four) will be sometime in January. The David Tennant Daily News Digest for Wednesday 5th December. David Tennant's sketch is on the Extras Complete Collection DVD which includes a photo of him on on the cover. The Guardian reports that Nativity 2 Danger In The Manger! is #4 at box office this week and that it took another �1,204,066 from 442 sites in this last week which makes a total of �3,165,716. David Tennant Treat 4 Today . Glasswerk.co.uk reports that an item on Acres Of Lions front man Jeff Kalesnikoff's Christmas list is to meet David Tennant. The Big Issue website has now posted David Tennant's interview. The David Tennant Daily News Digest for Tuesday 4th December. Chad.co.uk have posted a 2 star review of Nativity 2 Danger In The Manger which says some nice things about David Tennant pulling the plot together. Absolute Radio again opened their telephone lines for people to do an open audition to appear in their Nativity play with David Tennant on Friday 21st. To audition telephone 0330 123 1215 and the line you need is: "We bring gifts from the East of Gold, Frankincnce and Myhrr." Tonight Broadchurch producer Richard Stokes tweeted that there will be 4 months of post-production work on the drama which ties in with a Spring 2013 broadcast. The David Tennant Daily News Digest for Monday 3rd December. The Hertfordshire Mercury has another slant on the Doctor Who 50th anniversary (which mentions David Tennant). This morning Absolute Radio sent a tweet asking for fans to ring in if they wish to appear in their Nativity play with David on Friday 21st December. Today is the final day of filming on Broadchurch. The crew have said they expect transmission to be in Spring 2013. Although it is not known whether or not David Tennant is on set today, they are filming within sight of the Clifton Suspension Bridge according to producer Richard Stokes. Worldwide link to watch the video of David Tennant's episode of Dragons: Riders of Berk called Thawfest. TVWise have posted more casting news for Broadchurch as they say that Sanchia McCormack will be appearing in at least two episodes of the series. David Tennant and Catherine Tate's production of Much Ado About Nothing is mentioned in a BBC article about a new version which will be produced at at the Old Vic during 2013. SFX has a Doctor Who 50th Anniversary Accumulator page with a quote from David Tennant. The David Tennant Daily News Digest for Sunday 2nd December. Sunday World gives Nativity 2 Danger In The Manger! 3 stars in its review which also has the title "Tennant Is A Treat In Festive Gift." The David Tennant narrated Twenty Twelve has been nominated for the Best Sitcom Award in the British Comedy Awards 2012. The winners will be announced in a live show on Channel Four on Wednesday 12th December. It was 4 years ago tonight that David Tennant played the first performance of Hamlet at the Novello Theatre in London. Now that the issue is no longer on sale, scans of David Tennant's interview in The Big Issue have been posted onto Tumblr. No reason was given but David Tennant did not appear on Magic Meets With Neil Fox tonight. Unfortunately (due to illness) the David Tennant Quiz had to be cancelled tonight. Nativity 2 Danger In The Manger was featured on the Sky One Top Ten Show today as the movie is number 3 at the UK box office. Today Christian O'Connell tweeted that on his show tomorrow on Absolute Radio (from 6am) he will have details regarding how fans can get tickets to attend the show when David Tennant is co-hosting on Friday 21st December. The Bromsgrove Advertiser has an article about the Avoncroft Museum which featured in Nativity 2 Danger In The Manger! The article includes the quote "Both David Tennant and Marc Wootton visited our Edwardian tea room." The David Tennant Daily News Digest for Saturday 1st December. The first autism-friendly screenings of Nativity 2 Danger In The Manger! are shown in cinemas around the country today. David Tennant Quiz #127 (which is about the Doctor Who episode Smith & Jones) is at 6pm today hosted by the account @DTQuiz. From 7pm today David Tennant is one of the guests choosing his favourite tracks on Magic Meets With Neil Fox on Magic 104.5 FM which can be listened to worldwide. Andy Foster kindly tweeted to us this photo David Tennant and Olivia Colman while they were filming Broadchurch. Tonight the European Film Academy Awards were presented in Malta. The Pirates! In An Adventure With Scientists was nominated for the Animated Feature Film 2012 Award but unfortunately did not win. Tomorrow at 7pm David Tennant will be one of the guests choosing his favourite tracks on Magic Meets With Neil Fox on Magic 104.5 FM. David Tennant Treat 4 Today - David Tennant's voice-over for Scottish SPCA. The David Tennant Daily News Digest for Friday 30th November. The Guardian has a sweet story about a 5 year old actor who wishes to emulate David Tennant.